When I do spend time with Jethro, we usually have quite an adventure. In fact, recently we got lost in the woods during a rainstorm on one of our walks. However, that isn't the most exciting news of these past few weeks. Get this: Jethro is actually a dog x donkey hybrid, aka a dogkey. Dogkeys enjoy long walks, cuddling, and most of all: Frisbee. Yup, I taught Jethro how to play Frisbee. In all of 10 minutes. Being the easily amused person I am, I got to thinking about what tricks I could teach Jethro. Bowing, sitting, and all those shenanigans are too mainstream. Jethro is no mainstream mini. Jethro is a sassmaster who needs to channel his sass by doing something outside of the box. Jethro needs to play Frisbee. I started out by just having him touch the Frisbee with his nose, just like targeting. After he got that down, I threw the Frisbee and had him run over and touch it with his nose. Cue a lot of treats, clicks, and praise. Once he got this down, I had him hold the Frisbee in his mouth. Furthermore, I threw the Frisbee and had him pick it up and bring it back. 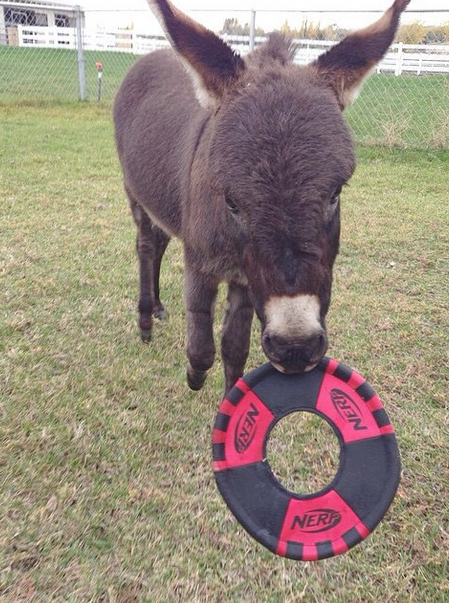 Donkey playing Frisbee. Not something you see everyday, huh? P.S. I have no idea why your blog wasn't in my reader... grr... I fixed it now so I can stay caught up. Yes, you need to get back to it! Very cool! I bought a clicker a while back but never got started doing anything. Feeling inspired now! Thanks! It is definitely a useful method for trick training! That would be cute! Hahaha, keep me posted on how it goes!